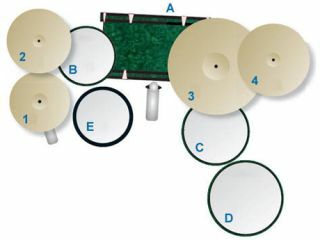 Has the advantage of simplicity, and allows you to get your ride cymbal in close and at perfect height. The drawback is that your ride cymbal ends up higher and not so close. Classic Buddy Rich/John Bonham set up - Buddy hung his towel on the second floor. Looks cool, but can be unstable, and it's difficult to position everything where you want. More stable, but slightly less resonant than tom mounted on Floor Stand. Give it a little extra sustain, but are heavier and bulkier, so need bigger cases. …with intrusive, 'disappearing' tom arms. Less bulky, with better lateral reach. But you lose resonance. Make sure the arms will clamp a small (12") drum, but don't clamp the drum hoops too tightly.